Please join us for the Edmonton-Ellerslie 2016 Constituency Forum! 1. Health care: an emphasis on the fentanyl crisis in Edmonton will be made. 2. Education: curriculum, to the devleopment of new schools. 3. Human Services: AISH, Alberta Works and programs that help women fleeing from domestic violence. 4. Community Grants: playground funding and processes for applying for grants. Lunch will be provided so it is important that you pre-register for the event. There is no cost to attend. If you would prefer to pre-register by phone, please call 780-414-2000. Please join the Alberta NDP Edmonton-Ellerslie Electoral District Association members and friends as we celebrate community by comig together to enjoy an evening of music, spoken word and friendship. Tickets to this event are $25. For more information please call 780-293-8496. Please join us for a delicious Buffet Lechon (Pork) Dinner starting at 6:00 PM. 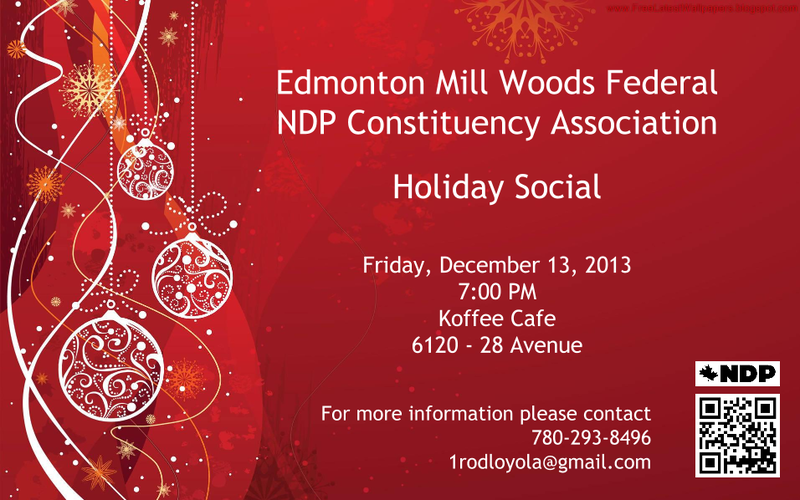 Proceeds of the event will go to the Rod Loyola for Edmonton Ellerslie Campaign. In recognition of the International Day for the Elimination of Racial Discrimination we are happy to host a full day of discussion and community building featuring several amazing Edmontonians working directly on issues of racial equity in their organizations and communities! Our facilitator for the day will be Irfan Chaudhry @RiffC, recently featured in the Edmonton Journal for his work on hate crime in YEG. Amarjeet Sohi, City of Edmonton Councilor, representing government perspectives on equity and inclusion. Natasha Goudar, Manager for the Edmonton Police Service’s Equity Diversity and Human Rights Section, speaking on the challenges and opportunities for doing racial equity work in policing and law enforcement. Jill Chesley, Diversity, Equity and Inclusion Advisor with Enbridge speaking to the work being done in the private sector. Gary Moostoos, Advisor at Boyle Street Community Services speaking to social services and the non-profit sector. Attendees will have an opportunity to actively build strategies and network to create an #edmontonforall ! 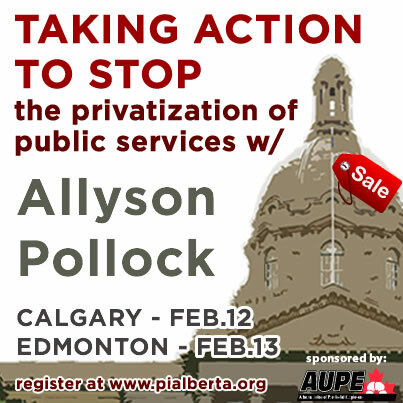 Corporate control of our affairs through tactics like the privatization of public services, deregulation, attacks on organized labor, “free” trade treaties, outsourcing of local jobs overseas, cuts to education, healthcare and other basic public services, and other methods, is very real in Alberta and Canada. For example, a recent move by the Alberta government has removed the role of Alberta Environment in approving energy projects, and put approvals squarely into the hands of a single body, the Alberta Energy Regulator. This agency is 100% funded by industry, and has forced unionized AB environment and other workers to quit the unions and to join them. Can we really expect the fox to guard the chicken coup? In Latin America, the takeover of governments by militarily backed regimes controlled by industrial interests has also been a very “real” experience. Those opposed have been forced to flee, to face “disappearance” and often, to suffer serious physical harm. Many would argue that this could not happen here. At the same time, democracy has been undeniably eroded under Harper’s dreams of Canada as an “energy superpower” and the rapid growth of the “petro-state”, especially here in Alberta. The Council of Canadians is honored to present a panel of local Latin American ex-patriots to tell their stories of corporate rule, and to suggest lessons for all Canadians. The discussion will be followed by a social gathering including refreshments. Yazmin Juarez is a Guatemalan Canadian who has had extensive first-hand experience in confronting mining corporations in their consistently unethical exploitation of natural resources in Guatemala. Her perspective on neoliberalism is largely one of indigenous peoples. Yazmin also is the Coordinator of the Youth & Young Adult Mentorship Program of the Memoria Viva Society of Edmonton. Rod Loyola is the President of the Memoria Viva Society of Edmonton, as well as the Chair of the Post-Secondary Education Task Force with Public Interest Alberta. Rod has been a Board of Director on numerous local and national non-profit organizations during his career as an activist and community organizer focused on both local and international socio-economic and political issues. He has also been involved in a number of grassroots educational/advocacy campaigns for the last 20 years focused on making an impact on public policy at all levels of government. Light dinner to follow at the Oliver Community League Hall at 10326 118 St NW, Edmonton, AB. Now that the Municipal Election is over, it is time to get back to work on the 2015 Federal Election. 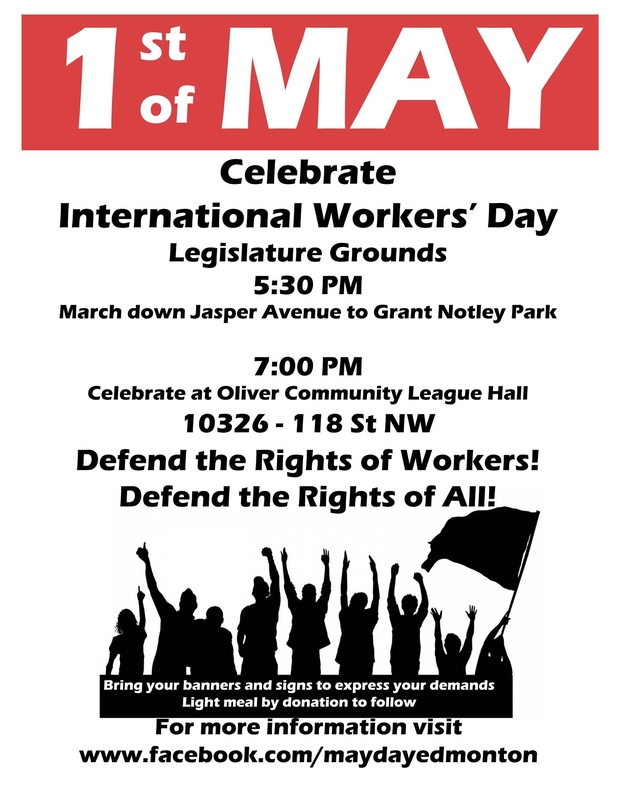 To confirm your attendance please call 780-426-6076. Please leave a message. 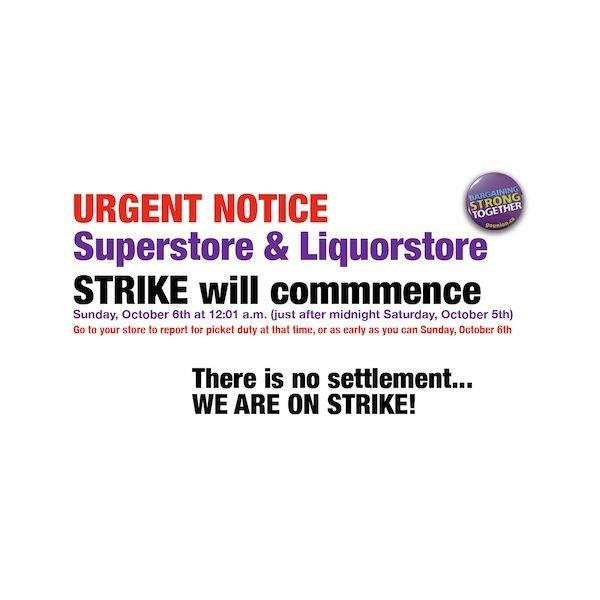 At 12:01 AM, October 6th, 2013 UFCW Workers are going on strike. 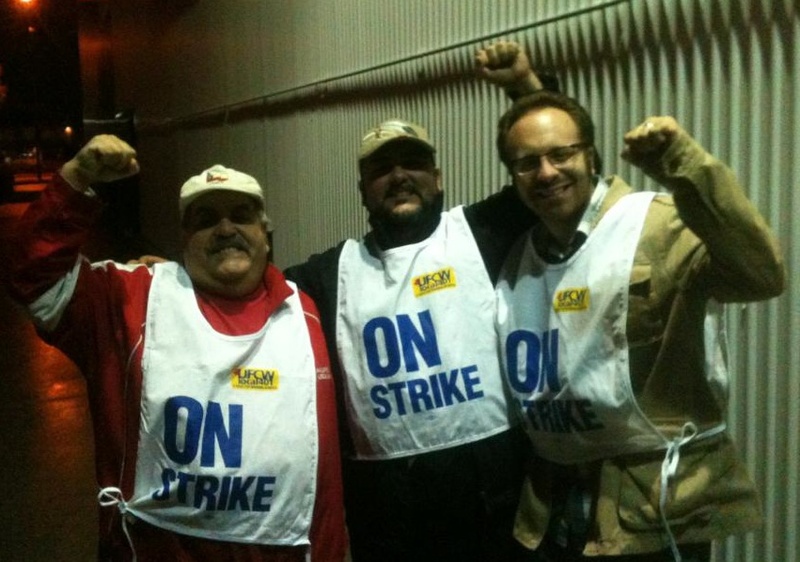 SOLIDARITY! Join the line. Hello family and friends, I need your help to recruit more people to the Mill Wood-Beaumont NDP Constituency Association. If we are are going to make a difference in the 2015 federal election, we need to start organizing now. Please join me on April 23! If you live in Mill Woods-Beaumont please join us for the NDP Annual General Meeting for the Riding Association of Edmonton Mill Woods-Beaumont on Tuesday, April 23 at 7PM at the Mill Woods Branch of the Edmonton Public Library (601 Mill Woods Town Centre, 2331 – 66 Street). For more information contact Stephanie Michaels, President at stephim@telus.net or 780-490-0849. All are welcome, but to be eligible to vote or run for executive you must live in a participating riding and hold a current NDP membership. Memberships may be renewed by calling 780-474-2415. We have two years of hard work so we may make an impact in Edmonton Mill Woods-Beaumont in 2015. Join us and help make history! brought the plight of retain workers front and centre in the media and the public mind. 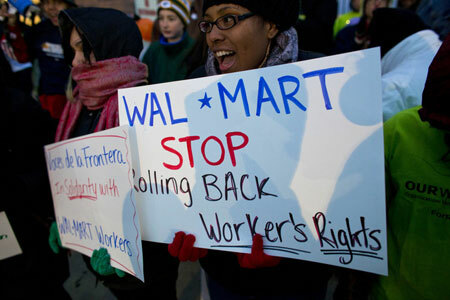 While this was a huge step forward for worker’s rights, there is still more work to be done. the protests at various locations across the province. 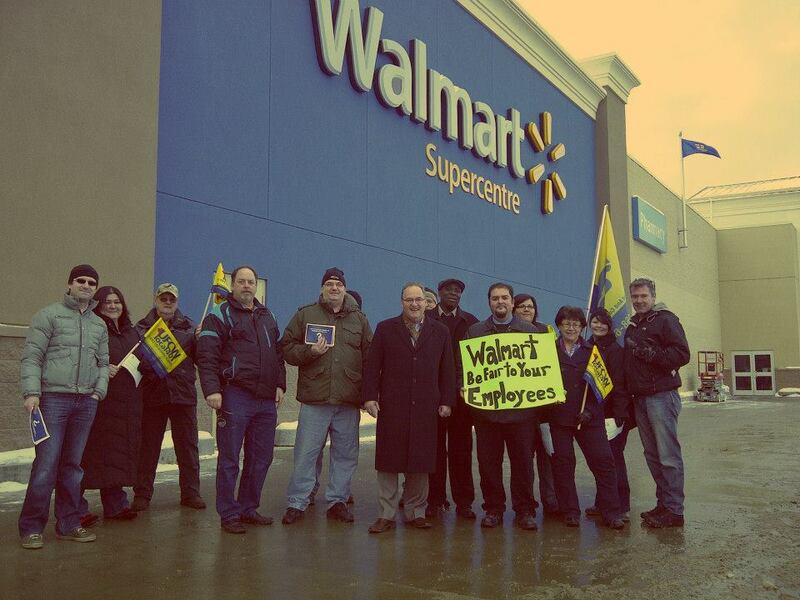 Let’s stand in SOLIDARITY with Walmart employees!